Breathing isn’t a mere physiological process. It supplies oxygen to the system and is vital for basic functioning. So if breathing is so important, why not do it the right way? 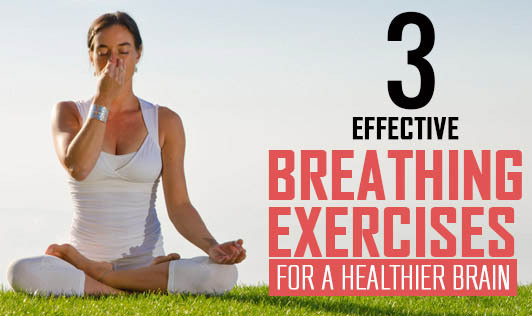 Read on to learn 3 very simple breathing exercises that can improve brain function. Alternate Nostril Breathing: Quite popularly known as ‘Anuloma Viloma’, this age old breathing exercise is the easiest to perform. Simply begin by inhaling through one nostril, holding your breath, exhaling through the other nostril. Anuloma Viloma enables optimum functioning on both sides of the brain and empowers neuron function. Crossed Squat Breathing Technique: Stand straight with your shoulders apart and toes pointing forward. Hold your left earlobe with your right thumb and finger and the right one your left thumb and finger. Squat down in this position while breathing in and lower yourself to a position as comfortable as possible. Get back to your original position as you breathe out. This exercise is known to synchronize the left and right hemisphere of the brain, thereby improving its function. Teddy Bear Breathing: Lie down on your back and put a teddy bear or pillow on your navel. Inhale slowly and try to raise your stomach, not the chest as you do so. When the air seems full in the belly, count to four and then exhale as if you have expelled all the air from your lungs. This breathing practice takes care of stress and helps you feel more relaxed. Repeat it at least 5 times for better relaxation. Try these breathing exercises when you feel stressed and the results will definitely be beneficial if you practice them regularly.